The Race of Champions could return to London using the new Olympic Stadium as a future venue, according to co-founder and organiser Fredrik Johnsson. 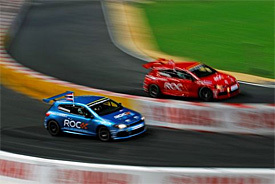 London last hosted the event in 2008 at Wembley, with Sebastien Loeb beating David Coulthard in the individual final. In the following four years it has travelled to the Bird's Nest Arena in Beijing - also the 'home' of the 2008 Olympics – Dusseldorf's Esprit Arena in Germany and, this year, the Rajamangala Stadium in Bangkok. Johnsson says the RoC is likely to continue travelling to different destinations, but said he is keen to build upon initial discussions to use the Olympic Stadium as a future host venue. "We want to be a global event, even if our offices are in Europe. I think we will keep moving and going to interesting places around the world," Johnsson said. "As long as the world's best drivers follow us, we will have more adventures ahead of us. "After Wembley, the Bird's Nest, the Stade de France, there are a few other iconic stadiums in the world where it would be cool to put the RoC stamp." Asked whether that could include London's Olympic Stadium, Johnsson said: "Absolutely. It's a great stadium. They contacted us and we have had initial discussions. "I know they have other priorities for the moment with the Olympic Park, but that is something that we would obviously be very open to discussing further. "If we can make it happen then why not?" Johnsson also hinted the race could seek more venues in Asia, adding: "Asia is an extremely interesting market where the interest in motorsport is just getting bigger and bigger. "It's a building process, and it will just get bigger from here on."